Literally translated, feng is the Chinese word for "wind" and shui means "water," two elements that are associated with good health in Chinese culture. Feng shui also incorporates the Taoist doctrines of chi, or the energy in nature, and yin and yang, the two opposing but interconnected forces that make up the entire universe. The practical applications of feng shui involve arranging your surroundings to allow a free flow of chi and a balance of yin (passive energy) and yang (active energy). Feng shui principles are based on the five basic elements of wood, fire, earth, metal and water as well as the colors associated with each one. Beds, couches and other main pieces of furniture should be placed centrally in the "command position." Leave high-traffic areas open and unrestrained for ease of movement. Don't store items under your bed. It creates negative energy that disturbs sleep and holds you back. Keep your apartment tidy. Clutter symbolizes unfinished business and prevents a free flow of chi. Mirrors, which represent the element of water, are sometimes referred to as the "aspirin" of feng shui because they add a calm and refreshing energy, but strategic placement is key. House plants are an important source of energy, and silk plants are an acceptable substitute if you don't have a green thumb. Avoid dried flowers, which represent negative energy. Opt for softer lighting from desk and floor lamps, candles and string lights. Choose coffee tables and other accessories that have soft, rounded lines. Sharp angles are considered dangerous and a source of "arrow-like" energy that makes people irritable and uncomfortable. Artwork is a vital part of a home's energy. 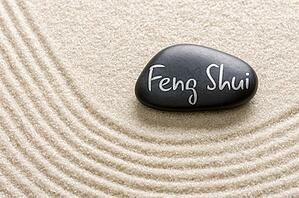 Choose subjects and placement based on the five elements of feng shui and what areas of your life you want to improve. Are you an advanced student of feng shui? Share your experiences and tips in the comments!